Today is a Mosaic Family Sunday, so bring your skates and join the Blades on the ice after the game! The Blades will look to make it 4 wins in a row while extending their point streak to 10 games (7-0-2-0). Saskatoon still remains 6 points ahead of the Moose Jaw Warriors in the East Division… the Warriors have 3 games in hand and are also in action today in Calgary. Meanwhile, the Wheat Kings are trying to get back into the playoff picture, trailing the Calgary Hitmen by 6 points for the final wild card spot in the East. Max Gerlach and Gary Haden each had a goal and an assist in a 4-1 win last night in Swift Current. Nolan Maier picked up career win #50 thanks to a 24 save effort. Riley McKay and Cyle McNabb had the other goals for Saskatoon while Dawson Davidson also had 2 points in the win. The Wheaties are also coming off a win over the Broncos… a 3-2 shootout decision on Friday in Brandon. This is Brandon’s final trip to Saskatoon in the regular season; the Blades lead the 6-game series 3-0-1-0. 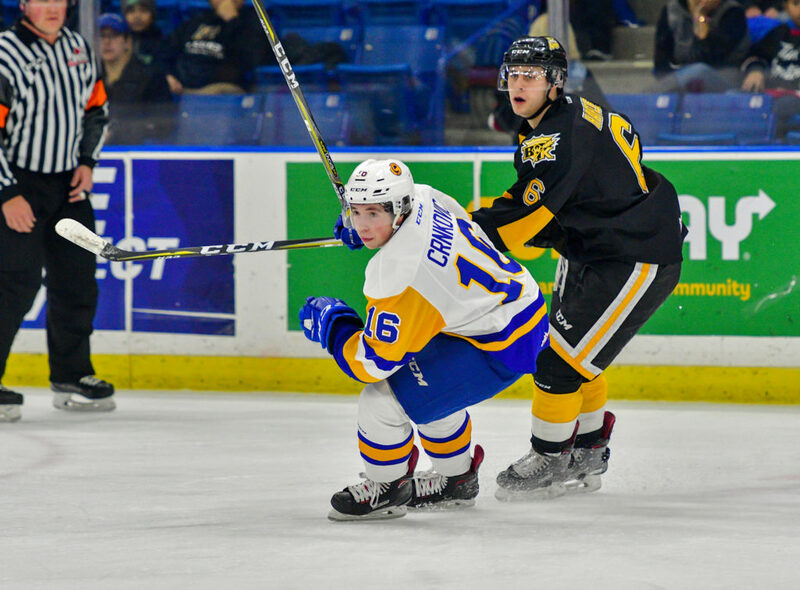 The most recent meeting was this past Tuesday in Brandon; the Blades won 7-3. Max Gerlachand Gary Hadenlead the Blades offense in the season series with 6 points each. Brandon captain Stelio Mattheos leads the Wheaties with 8 points vs the Blades. Dawson Davidson had another 2 assists last night, his 2nd straight multi-point game. Max Gerlach has goals in 5 straight games and Gary Haden had 1G-1A last night.